So, like I said in my previous posts, this is my first Thanksgiving. However, I'm not feeling the mad rush to produce dinner, since my uncle's dad has already volunteered to do so, which is a relief (though I am thinking about dessert, I hope he doesn't mind). It will also be my first Black Friday, or the day after Thanksgiving that, as I understand it, there's usually no work and stores slash their prices to encourage buying for the next big holiday. There've been horror stories about this, sadly, but I'm avoiding that rush too and thankfully there's the task of babysitting my cousins while my aunt and uncle go to work (no surprise there, as she works in Nordstrom). I'm staying behind for a different kind of "rush", though, and that's online shopping deals. I have no idea why I ignored it completely before but ever since I saw a Corelle Livingware dining set for $18 I've been hooked on watching the Gold Box deals over at Amazon. I didn't get the dining set (I'm still hitting myself for that one) because I waited too long to get it, but I'm just waiting for that next big-ticket item. While it's not likely that I'm going to get a DSLR without a paycheck, it's still exciting to see the price drop. Okay camera, stop staring at me... I'll get you someday. These are really tough to mess up (unless you pour boiling water into the custards, then I can't help you). 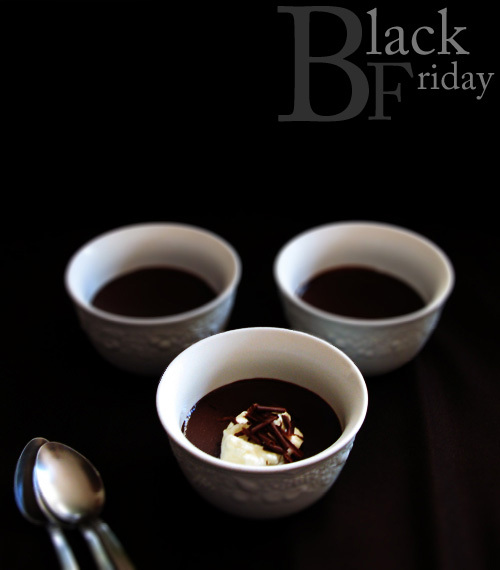 Enjoy with a dollop of unsweetened whipped cream. This makes 8, but can be easily halved- the baking time is the same, of course. Have on hand 8 oven-proof cups that can hold 175mL (3/4 cup) each. Take a roasting pan big enough to hold all of them without touching and deep enough to hold water that comes up to 3/4 of the way up the sides of the cups and fill it halfway with water (the cups won't be in the pan at this stage). Preheat the oven to 175°C (350°F). Place than pan with water in the oven in the meantime. 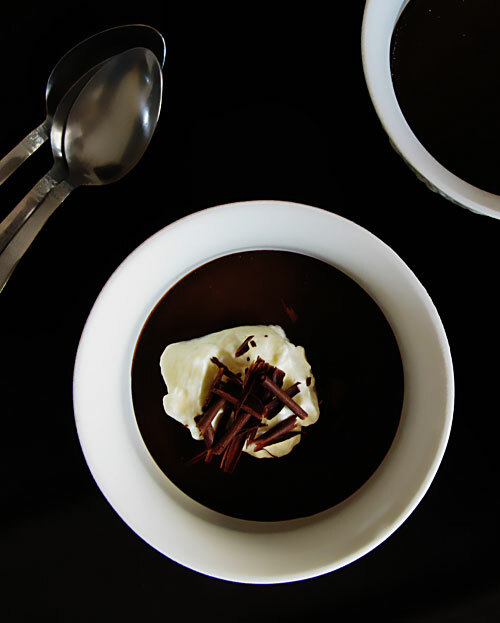 In a heatproof bowl set over a saucepan of barely simmering water or in a microwaveable container in the microwave, melt the chocolate and remove from the heat. In a small saucepan or in a microwaveable container in the microwave, combine the cream, sugar, and salt and bring to a boil. Pour it into the chocolate and whisk until blended. Place the egg yolks in a mixing bowl and whisk until blended. While whisking madly, pour the cream-chocolate mixture in a small stream and whisk until blended. Pour this through a fine sieve into a container with a spout. Divide this among the oven-proof cups. Take out the pan with water from the oven and place the cups in the pan carefully. If necessary, pour in more water into the roasting pan so it comes up 3/4 of the way up the sides of the cups. Bake for 20-25 minutes or until the sides are set but the center is slightly jiggly. Remove from the oven and take the cups out of the water bath. Let cool and serve warm or chilled with whipped cream.